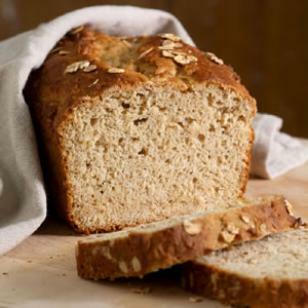 This honey-oat bread has a pleasant flavor and divinely moist, tender crumb. It requires minimal mixing and cleanup, calls for ingredients usually stocked in the pantry, and is tasty yet healthful. Bake the loaf until well browned on top and a toothpick inserted in the center comes out clean, 40 to 50 minutes. (Itís normal for the top to crack.) Let stand in the pan on a wire rack for 15 minutes. Run a table knife around and under the loaf to loosen it and turn it out onto the rack. Let cool until barely warm, about 45 minutes.